Arrival to Buenos Aires and transfer to the hotel. Tour of the northern neighbourhoods Recoleta and Palermo including a "cafecito" at a nice confiteria (café). Discover the southern neighbourhoods La Boca and San Telmo. In the evening, create your own empanadas and enjoy grilled provoleta cheese, an excellent steak and typical alfajores, Argentina’s national sweets, for dessert. Experience local traditions at the small town of San Antonio de Areco and explore the Argentine pampa. Visit a typical ranch, where the world-famous Argentine Asado (BBQ) will be served for lunch. 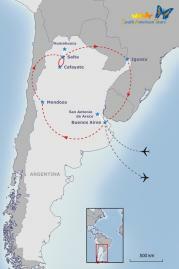 Flight to Mendoza and transfer to the hotel. Discover one of the best oenological areas in the world! Visit different vineyards with wine tasting and enjoy a cooking class with lunch at Zuccardi Winery. Continue to Salta, the culinary centre of northern Argentina. Attend a folkloric dinner with Andean cuisine, music and dancing. Overnight at the hotel. Visit to the San Miguel market where locals sell their produce, meats and spices. Attend a cooking class with a light lunch of local specialties such as tamales and humitas. Full day excursion to the Humahuaca Gorge including the Cerro de Siete Colores (Seven Colours Hill) and Tilcara with its Pucará (indigenous fortress). Continue north and visit Humahuaca town to appreciate the handicraft market. On the way back to Salta you visit the city of Jujuy. Transfer via Cachi to Cafayate. Cachi is a picturesque village in the Calchaqui Valley that has conserved its colonial style mixed with the heritage of its inhabitants. Enjoy lunch and wine tasting at a local winery. Overnight in Cafayate. Panoramic transfer (ca. 3h) via Quebrada de las Conchas back to Salta. Flight to Iguazu and transfer to the hotel. Excursion to the Argentine and Brazilian side of the Iguazu waterfalls. Flight to Buenos Aires. In the evening enjoy a sultry tango show with dinner at El Viejo Almacén to top off your culinary Argentina adventure.